Natural products have long been excellent source of novel active agents that may serve as the leads and scaffolds for elaboration into efficacious drugs. According to a review of New Chemical Entities (NCE) from 1940 to 2006, approximately 65% of drugs were delivered from natural products, or mimicked them in one form or another. Through the medicinal chemistry approach, natural products can be modified synthetically to improve their pharmacological profiles. During the past five years, the modification, structure-activity relationship (SAR), and drug discovery from natural product have been studied. Erioclyxin B, taxoids, cheliensisin A, and so on were selected as starting material because of their potent bioactivity, unique structure or high content in plants. 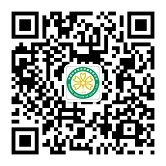 Eriocalyxin B (1) was regarded as the promising candidate for new anticancer agent because of its potent activity, high content and novel mechanism of action. Systematic modification was performed on eriocalyxin B and twenty-two derivatives were synthesized and evaluated for cytotoxicity against five tumor cell lines. The SAR revealed that α,β-unsaturated ketone at ring D and A are the leading active sites. The OH-6 and OH-7 are the important enhancement factors for the cytotoxicity. 7,20-epoxy structure is more suitable for keeping a good activity than the corresponding 3,20-epoxy structure. Transformation of 1 to its 6,7-seco derivative (19) resulted in a good activity, while its 6,7-seco-20-carboxyl derivative (20) show no activity. This suggested the carboxyl group might destroy the activity, which was firstly reported . These results have been published in theEuropean Jouranl of Medicinal Chemistry. Taxchinin A, one of the major taxoids contained in the leave of Taxus. Chinesis, possesses novel abeo-taxane skeleton. 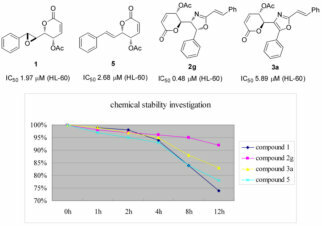 With taxchinin A as starting material, twenty-one derivatives were synthesized and evaluated for cytotoxicity against human non small lung cancer (A549) cell line. Nine derivatives showed potent activity with IC50 values from 0.48 to 6.22 μM. The observed SAR of these derivatives shows that exocyclic unsaturated ketone at ring C is the key structural element for the activity, while the α,β-unsaturated ketone positioned at ring A have no effect for the activity. Further investigation on the SAR utilized a CoMFA method was carried out. The resulting 3D QSAR model provides an valuable tool to design more cytotoxic compounds. These results have been published in Bioorganic & Medicinal Chemistry. Cheliensisin A is a natural styryl-lactone isolated from Goniothalamus cheliensis Hu in considerably large quantity with putative anticancer activities. However, its poor water solubility and chemical instability have precluded cheliensisin A as a potential drug candidate. To explore the strategy to overcome these problems, 21 novel derivatives of cheliensisin A with different substitutions at C-7 and C-8 positions were designed and synthesized. Inhibition of proliferation against five tumors cell lines indicates that eight new derivatives with embedment of oxazole or oxazoline exhibit improved cytotoxicity on SK-BR-3 and PANC-1, and compounds 2d and 2gshow 5-8 folds higher potency than cisplatin. HPLC investigation of representative compounds indicates that oxazole and oxazoline analogs exhibit much improved chemical stability than their natural parent. These results were published in the European Jouranl of Medicinal Chemistry.